The Auto Marketing Blog: Did MINI Just Diss Its 160,000 U.S. Fans on Facebook? Did MINI Just Diss Its 160,000 U.S. Fans on Facebook? 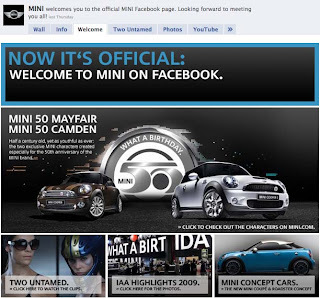 MINI just launched its “Official MINI Facebook Page.” Huh? MINI, waited until the Fall of 2009 to join the Facebook community? That doesn’t sound right. Well it isn’t exactly correct. MINI has been on Facebook for quite awhile with their MINI USA fan page. 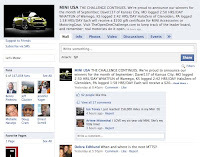 The MINI USA site has a significant amount of fans, 167,208 when I last looked. The new MINI fan page has 15,278. Why would MINI create a whole new “official” fan page out of thin air when it already had over a 160,000 fans on its very active U.S.A. site? The obvious answer is that MINI is a global brand and the US team wanted to promote their marketing efforts separate from the global marketing team. But this doesn’t make a lot of sense when looking at other global brands like Ford, General Motors, Toyota, Hyundai, Honda… well just about everyone. Creating one brand fan page destination on Facebook makes a lot of sense, separating out the US site from the global site seems a bit foolish. “Building a single corporate page instead, offers more meaningful ways to connect online… There are already so many fan pages on the site and some products even have multiple pages, making it difficult to tell a cohesive story about a brand,” reports Aarti Shah for PR Week. Consider someone who wants to “fan” MINI. 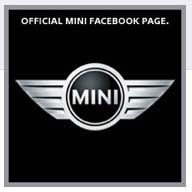 They search for MINI and come across the MINI USA and MINI fan pages, with the latter having a graphic saying it is the “Official MINI Facebook Page”, which one would the soon to be fan join? Probably the Official one since it clearly states it is official. More importantly, what about media campaigns to build fans or advertise the MINI brand on Facebook? I’d assume these efforts would bring users to the Official page and leave the USA page alone. The MINI USA page now gets fans at a much slower rate, since the marketing dollars don’t direct people to it, and eventually the Official MINI fan page becomes the dominate page that does all of the marketing communications; thereby, leaving the 160,000 plus fans of the USA page ignored. This was a very odd decision by a brand that usually gets it right. It will be interesting to see how the two sites co-exist on Facebook and if I’m right that the Official page will be where all the marketing dollars will drive to and if the USA site will eventually pale in comparison to the Official fan page. Either way, the MINI brand should have just converted their large fan community on the MINI USA page and transition it so the 160,000 fans would stay engaged in this latest Facebook effort by the brand. In someways, having an "unofficial" designation has its draws because we all know that getting it from the horse's mouth and being part of the official fan club doesn't give us any more insight or privilege. It does come down to numbers. And I agree with you, MINI f*'d up by saying, "Tada! We're here! For reals." But I don't think any of the 160K are going to really care - but financially, what a GIANT faux pas from MINI. Actually the MINI USA Facebook fan page is also "official" in the sense that it is developed and managed by the MINI brand team, not an enthusiast. But I totally agree with you that the fans really won't care, they also may not add themselves to the new "official" fan page which means the brand has lost them. Yes, a Car Dealer Can be a "Trust Agent"